Yesterday Matt, his sister Brianna, and I made a trip to Brooklyn for the day and night. We had every intention of getting there early to hit up the fantastic Brooklyn Flea I have heard so many good things about! Unfortunately, we got there muy late no thanks to the worse than usual traffic on 24. So we kind of missed the flea market. Not to worry though, we got a fantastic tour of the whole dang city! 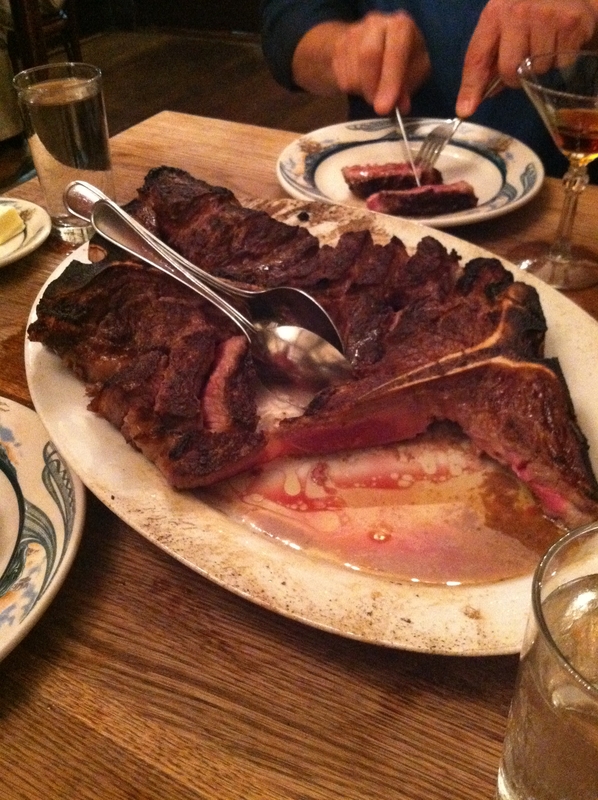 The main reason for our trip was to meet up with Matt’s parents for dinner at the one and only Peter Luger Steakhouse! yum, yum! Before we met for dinner we stopped at this adorable little bar, Dresslers on Broadway, basically across the street from PL. (yeah, I’m cool, I abbreviate it). We had some time to kill so we thought we’d stop in for a cocktail or two. The place was amazing! Such a great atmosphere in there and the bartenders were the friendliest people! And they make delicious cocktails as well! How can you beat that? I had a Raspberry Beret, which was a delicious mix of Prosecco, St. Germain, and fresh raspberries. And it was a pretty shade of pink. It was overall the most wonderful drink I have tasted in quite some time. Matt got the usual dirty martini and Brianna selected a drink that was pretty much a plethora of herbs and spices and alcohol hah. It was some mix of tequila and jalapeno peppers and cilantro amongst other things. I could do without the produce section in my drinks, but she was pleased. 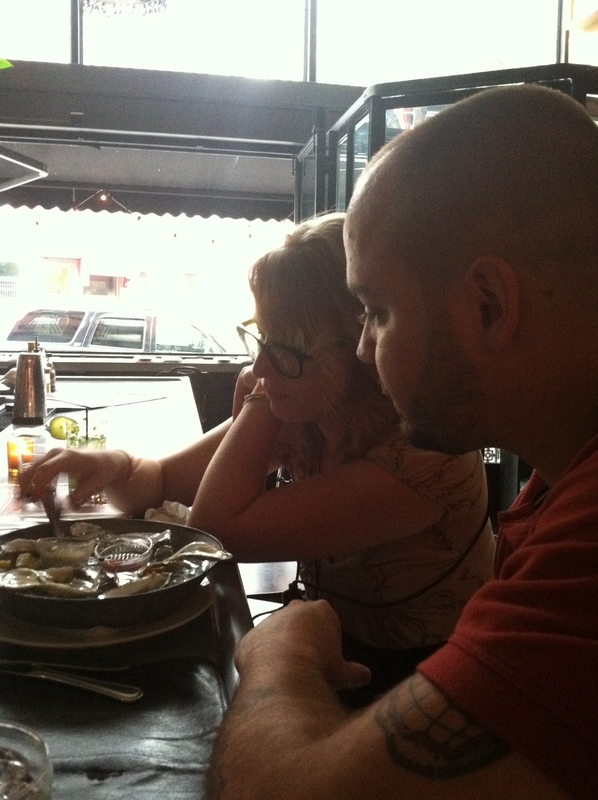 Matt and Brianna snacked on some raw oysters before we headed over to dinner. I did not partake in that activity for fear that I may vomit. There were oysters on the plate that looked like the pig ears we used to buy my old dog to chew on. I simply could not stomach it. But based on the rest of the menu and the way these two reacted to them, I’m sure they were fantastic if you are an osyter fan. I think that everyone could have split this steak. (Matt’s mom got her own mini steak to herself). At the end of the meal Matt and his dad were literally forcing down the final pieces because we are certain it is also “frowned upon” to leave anything behind. We ordered a side of creamed spinach (I tried it, but I don’t love it) and German potatoes (which were excellent). Truth be told… I literally hadn’t eaten all day before this. I had an iced coffee from Dunkin around 11 and a piece of a pumpkin cupcake around 1 and that was it for the entire day. By the time we were ready to go to Brooklyn Matt wouldn’t let me eat anything because it was too close to dinner and I would ruin my appetite, haha. So I had to beg the bartender at Dressler’s to find me some bread which he said had to be “expedited” because it was too early for the dinner crew. And ya know what? He found me bread! I don’t know where it came from but it was damn good. See… nice people! Anyway, back to my point. I hadn’t eaten a thing so I quickly became a little tipsy and it made my whole meal that much better. The wine at Peter Lugar’s was every bit as good as I thought it would be. We had many good laughs with each other and our outstanding waiter, Martin. He’s basically the man. Overall it was a fantastic night and I highly recommend hitting up Brooklyn sometime soon if you are in the area! Everyone puts so much focus on Manhattan, which I also love, but it’s time to branch out people! If you get the chance to visit Brooklyn or if you have before, let me know some of your favorite spots so we have new places to venture next time we visit! Thanks love you bye.